You are here: Home / Foot Care Blog / Diabetes / Got Cold Feet This Winter? It Could Be Your Diabetes! Got Cold Feet This Winter? It Could Be Your Diabetes! February 17, 2014 /0 Comments/in Diabetes /by Jenn F.
The cold weather brought by winter can make life really unpleasant for a diabetic. Your skin is probably feeling really dry this time of year, and you may not be as physically active as you’d like to be, which can leave you feeling lousy in more ways than one. Peripheral neuropathy — which causes numbness and pain in the hands and feet — is the most talked-about complication of diabetes, but there are other complications that may cause your feet to feel extremely cold. 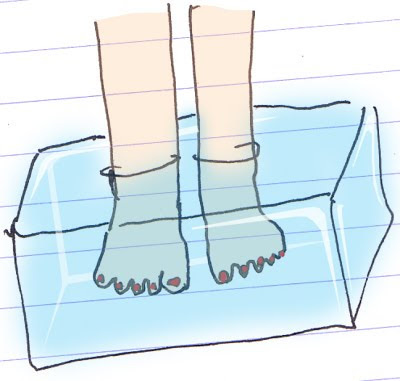 Diabetics often suffer from ice-cold feet, making winters particularly uncomfortable. Diabetes Feet: Why Are My Feet So Cold All the Time? We often hear the term “cold feet” related to nerves — like when a groom-to-be gets “cold feet” at the altar. As you know, nerves are greatly affected by diabetes. You may not feel anxious or stressed-out, but Peripheral Arterial Disease or Diabetic Vasculopathy may be causing an abnormal chill in your extremities. “I can hardly ever walk around without socks because my feet are literally like ice to the touch,” writes one diabetes sufferer. Diabetes author and community educator William Lee Dubois suggested that poor blood circulation related to diabetes was likely the reason behind her condition. He recommended that she check her capillary response by pressing her finger firmly into the skin of her foot for a few seconds. Normally, the tissue lightens and the color returns in less than two seconds. If it takes longer than this, then circulation is poor. Aside from diabetes, there are many other conditions that can cause chronic cold feet. – Cold temperatures: Cover your feet up with socks and slippers! – Frostbite: Have you been outside in windy, sub-freezing temperatures for more than 15 minutes? – Hypothyroidism: Are you feeling chilly all over? – Medications: “Beta blocker” high blood pressure medications, like Inderal, can cause cold feet. – Restless Leg Syndrome: Do you feel a creeping, crawling sensation up your legs when you’re at rest? – Tarsal Tunnel Syndrome: Compressed foot nerves is common among diabetics. There are many ways to warm up on a cold winter day, but invest in soft, warm socks first and foremost! Obviously, the best you can do is wear warm socks and well-fitting shoes, says Dr. Scott W. Kujath MD, a vascular surgeon at St. Mary’s Medical Center in North Kansas City, Missouri. Keeping your blood sugar under control will help with your circulation and temperature regulation, while keeping potential foot infections at bay naturally. Electric blankets can help keep you warm, but you need to be careful not to burn or overheat yourself. Some people like to take circulation-enhancing B-complex vitamins or apply creams containing capsaicin (the “hot” ingredient in spicy peppers). Simple foot exercises like wiggling your toes or running your foot over a tennis ball can also increase circulation, without costing you a cent. Poor blood circulation not only affects your foot temperature, but also makes foot wounds slower to heal. This can be especially dangerous when wounds come into contact with bacteria, fungi or viruses. If you have diabetes, we recommend owning a SteriShoe UV shoe sanitizer, which limits the microbes your feet come into contact with by killing 99.9% of the pathogens in your shoes using ultraviolet light.